When cyber criminals lack imagination, they try to create malware imitating notorious threats. Darkodercrypt0r Ransomware is one of those infections that may seem to be very dangerous, but in reality only a few changes are made within the system. 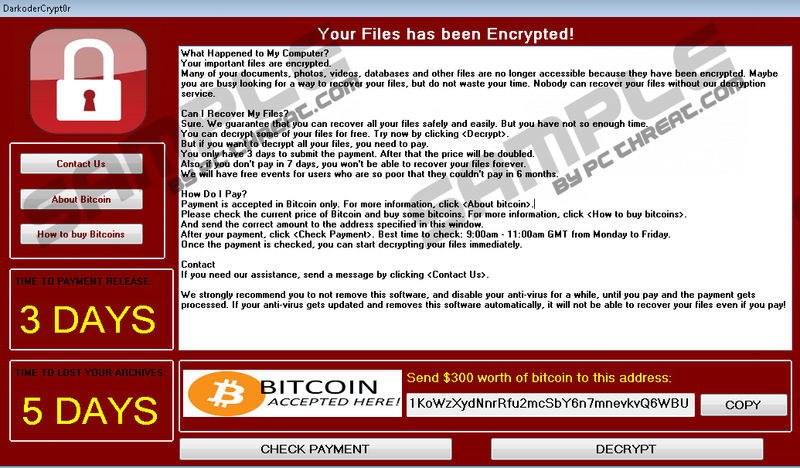 The Darkodercrypt0r Ransomware is an attempt to mimic the ransomware named Wana Decrypt0r, which is programmed to identify a wide range of file types and encrypt them immediately after accessing the computer. The complexity of the two infections aside, any malware program should be removed from the computer, and the sooner the removal is done, the better it is for the user and computer alike. Once the Darkodercrypt0r Ransomware is installed, it encrypts .txt files and appends the extension DARKCR, which is added next to the existing extension. The ransomware threat, the Darkodercrypt0r malware shows its ransom warning, but only when the user attempts to open one of the encrypted files. Unlike most dangerous ransomware infections, the Darkodercrypt0r Ransomware does not lock the screen, which usually means that the hoax warning is displayed soon after the system loads. In the case of the Darkodercrypt0r Ransomware, victims are informed that their valuable data, including documents, photos, databases and other files are encrypted. The fact that such data is corrupted can easily affect may inexperienced users and make them think that the warning is real and should be taken for granted. You should never trust such pop-up notifications as they are designed to trick you into spending money on imaginary recovery or decryption software. The Darkodercrypt0r Ransomware should be removed from the computer without hesitation even thought the warning says that you should not terminate the program displaying the pop-up warning. After removing the infection, you should consider backing up your data from time to time so that you not suffer from severe personal data-related damage. To recover the encrypted files, victims are required to pay a fee of 300 dollars in bitcoins, which is a digital currency available to everyone and owned by nobody. Bitcoins enables anonymity as money is transferred to digital wallets bearing no identifiable information. For example, the wallet address given by the ransom warning is 1KoWzXydNnrRfu2mcSbY6n7mnevkvQ6WBU. This money transaction method has become very popular among ransomware developers as they remain unidentified, which allows them to carry on their illegal acts and gain profits from unex. Any pop-up window requiring you to send a certain sum to a questionable account should be valued critically not to get deceived by cyber fraudsters. The Darkodercrypt0r Ransomware gets on the computer like any other threat, meaning that it can be installed alongside freeware, or it can be installed upon clicking on a malicious link. Questionable websites should not be browsed in order to prevent serious security issues, such as system malfunctions or data losses. If you do care about your online privacy and want to browse the Internet safely, you should not hesitate to implement a reliable malware and spyware prevention program which can fight off various threats. Although the Darkodercrypt0r Ransomware does not have the technical features typical of some highly powerful ransomware programs, we recommend that you remove it by running a reliable malware removal program. Fortunately, the infection is not programmed to create its files in different locations or modify the Windows Registry, so you can try eliminating the program by yourself using our removal guide. In any case, our team is ready to answer your questions. You should note that you manually remove malicious files at your own risk. Check the folder Downloads for malicious files and remove them if any spotted. Check the deskop if any downloaded files are saved to that directory. If no malicious files are found, press Win+R and type in %Temp%. Press Enter and search for questionable files. Quick & tested solution for Darkodercrypt0r Ransomware removal.